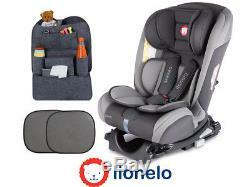 Car seat Lionelo Sander - Grey. 0-36 kg Isofix Top Tether. Lionelo Sander is our new car seat for kids, usable from birth, up to 12 years old. Made in unique technology that allows the seat to rotate 180 degrees both forward and rear facing. The child is transported with maximum protection thanks to the ISOFIX 180 system. Advanced security and comfort for your growing baby. With the backward facing seat, it's possible to carry a baby from the first days of life. For the comfort and safety of the youngest children, the seat is equipped with an additional reduction insert. The unique technology makes the seat easy to rotate without unfastening the seat belts. The buckle ensures, that in case of sudden braking or collision, less forces will affect the child. An additional cushion protects the child's head during side collisions. While driving, it supports the neck and improves comfort. Backrest adjustable even with one hand (from sitting to lying down position). It guarantees extraordinary comfort and right position of the child. Soft cushion guarantees driving comfort. Additional pads on the belts prevent the baby's sensitive skin from rubbing. Assembled on the front seat, allows you to rearrange your accessories and further protect them from dirt. External dimensions: 46 x 50 x 63 cm. Accessories: organizer and car window covers. Removable upholstery yes, can be washed in 30 degrees. Possibility of rotation of the seat: yes, 180 degrees. Additional security system: additional ImpactBlock cushion. Age range: from birth up to 12 years old. The item "Baby Child Car seat Grey Rear and Forward Facing ISOFIX TOP TETHER 0-36 kg" is in sale since Tuesday, August 28, 2018. This item is in the category "Baby\Car Seats & Accessories\Car Seats". The seller is "matfi_pl" and is located in Tychy. This item can be shipped to United States, European Union member countries, Canada.